26.2 Quest: Look Who Is Running The Georgia Marathon For Free! Look Who Is Running The Georgia Marathon For Free! The Publix Georgia Marathon is quickly approaching and the winner best be already training. The giveaway started just before Christmas, but the gift of being able to put yourself through torture for 26.2 miles is being given away now. March 18th will be here before you know it, and those running will be heading through the streets of Atlanta to once again claim victory in the battle against the hilly marathon and half marathon courses. If you have not yet registered there is plenty of time and you can secure your spot for $10 less than the current rate by using the discount code 262QUEST when signing up. Too many people were thinking of others during the Christmas holidays (or were wondering how they could possibly run that far given the way they were currently eating) and so the entries stayed a bit lower with just 37 total entries. 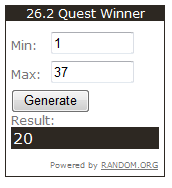 With 37 in the Random number generator the button was pushed and the lucky number 20 revealed double_jogger as the winner. double_jogger is looking to run the Publix Georgia Marathon to get back into shape post baby, let’s all congratulate her! Please contact me at info@262quest.com by Friday to claim your entry or I will need to pick a new winner. For those of you that didn’t win, thank you for reading & entering…………… and stay tuned! soooooooo excited! Totally lit the fire under me already! thank you!!!! That is awesome! Congrats to double_jogger! What Does it Feel Like to Not Run?